It's no secret that I LOVE my fruit. There are very few fruits that I don't enjoy, and some kind of fruit always features in my day somewhere. What's not to love? Vitamins, minerals, antioxidants, fibre, all jammed into one sweet, natural package. Of course I have my favourites, which tend to feature over and over in my snacks, salads, desserts and sauces - and it's easy to overlook some of the other fantastic fruits that we're so lucky to have growing in abundance here in Australia. 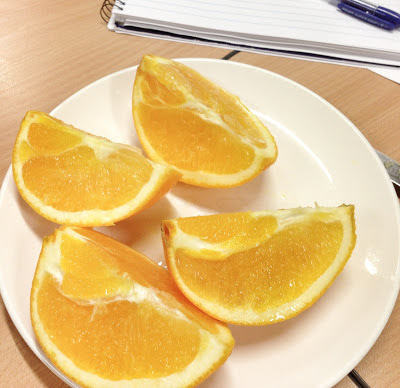 Given that I live in Victoria, where a huge proportion of our orange crops are grown, it's a little embarrassing to admit that I don't often grab an orange to enjoy. We do buy them fairly regularly, but they tend to end up as juice, or a little of the zest and juice get used in a recipe. 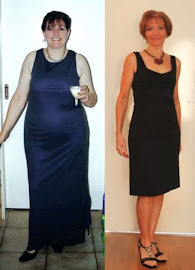 So when I heard about the Go Orange 10-day challenge from Citrus Australia, I jumped at the chance to take part and promote a naturally healthy food. 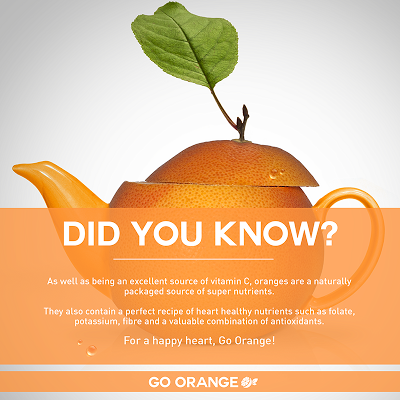 The challenge is really simple: during June, we're being asked to eat a whole orange every day for ten days to take advantage of all the nutritious benefits the fruit has to offer. 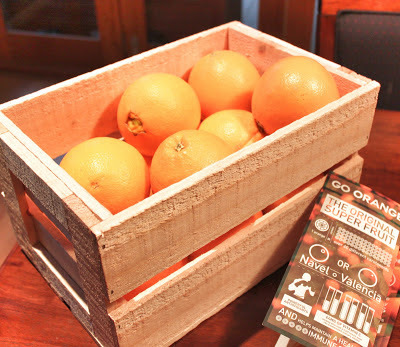 The cutest little crate arrived on Monday, with a dozen plump, juicy navel oranges inside. So I started my challenge on Tuesday, grabbing one and tossing it in my bag for my morning snack at the office. Keeping it simple: cut into quarters and eat. I've eaten one each day since and I have to say, I'm loving the change from my usual apple. Yes, it requires a knife and a plate (and washing my hands afterwards), but the flavour is divine. And I love the texture of citrus ...the way the little juice-filled particles pop! in your mouth. My snacks have been drawing envious comments from my colleagues too, as the scent of citrus oil and juice wafts across from my desk. I seem to have started something, as oranges have begun popping up around the office. They don't just taste good though - there are plenty of health benefits, including support for the immune system, antioxidants to reduce the effects of ageing, folate, potassium and other goodies that work to protect your heart health and of course, lots of fibre to fill you up - especially good if you're aiming to lose or maintain weight. I'll be Instagramming my daily oranges, so you can keep up with my challenge over there, if you're so inclined - You'll find me posting as @kerryn_w. As well as my whole orange a day, I also plan to get a little creative with my citrus and will share some recipes over the next few weeks featuring the brightly coloured fruit, so watch out for those. If you'd like to join in the challenge, just head out to the greengrocer or supermarket and grab a bag of oranges. Then you can blog about it, post photos on Facebook, Twitter or Instagram, or just keep it quietly to yourself - whatever floats your boat. You can also see what other challenge participants are up to over on the Go Orange Facebook page. There are even some recipes there as well - I spied an orange almond cake that I am so going to try! When was the last time you ate an actual orange, not just the juice? And what's your favourite winter fruit? I'm not a big eater of fruit I must confess. I recently started drinking orange juice (without the sticks / pulp stuff) at breakfast, but I do have it diluted with water as I find it sweet. I hope that's better than nothing. Can't wait to see what you do with your oranges!!! It's funny - I LOVE orange juice with pulp, but my kids hate it. I used to buy it and the buggers would refuse to shake the bottle before pouring a glass so they'd get minimum pulp in their drink. Then, when I'd go to have some, there was nothing but thick, pulpy sludge left in the bottle. I quit buying bottled juice...these days we squeeze our own. Well this in hardly a challenge for me, I love oranges. If you peel them then pull apart all the sections it takes a lot longer to eat and you become more mindful of what is going into your mouth and makes the eating process so much longer, really works for me when I'm trying to lose weight. I rarely juice oranges, it seems such a waste of good fibre. I agree, Deb. I rarely drink juice myself, but the rest of the family are huge fans.